After having a hand in writing what seems like every Milkyway Image movie since the late 90s, awards and nominations have been showered over the production house's writing team of Yau Nai-Hoi, Yip Tin-Shing and Au Kin-Yee. But the former one who jumped on the train early, even at the stage where Johnnie To made The Barefoot Kid, first got/wanted his chance to direct on his own. 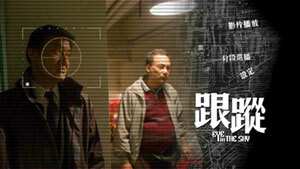 Yau Nai-Hoi may have been involved in the lighter output by Milkyway as well but his debut Eye In The Sky is a beast with its roots in cops and robbers-territory, albeit with a direction of his own as he dedicates a feature to the inner workings of the Surveillance Unit that often times merely get a sequence per film. Deciding partly against characters and for the thrill of the ride instead, Eye In The Sky makes its choices well and is to boot to be considered rather fresh by the time the quick 90 minutes are over. A high-tech story sounding and looking like it yet it really is quite basic when looking at its template, Yau along with co-writer Au Kin-Yee make matters straightforward, simple and the synopsis could almost fill a large chunk of the script. Very much a compliment that, Yau goes to work by planting us in what turns out to be real circumstances AND exercise. Without any hints at which is which until a bit into the opening sequence, he intrigues by treating the city like a playing field and cinematography expectedly goes overhead on us sometimes. It must be a well-oiled machinery from both cops and robbers standpoint and creating a story of a rookie being mentored by our senior, it's quite fitting that the debut filmmaker isn't out to squeeze the unexpected out of these proceedings. No one minds if the expected sweeps you away and Eye In The Sky has those qualities, even though it's most often times a medium-speed ride. Utilizing an at times headache inducing camera style that rocks back and forth in tune with the surveillance twists and turns, music is suitably hip and coolness-factor is conjured via use of such commercial and even lazy elements. But Yau Nai-Hoi has decided to believe in his tools and to put forth a challenge to himself to make sure he nails his mild intentions with this story. In many ways he does, giving us scattered but sufficient character depth too. This unit is often spread out but closely knit, apparently getting no time of, growing their beards but there's also always the light moment where everyone can stop to listen to a story told over the commsystem. Often the team member to convey one such, Simon Yam is for once playing something of a reversal of his screen persona here. Bering a veteran and a senior with an appetite, Yam running around with a disturbingly fake belly doesn't detract in fact and he may be sleepwalking his way through the beats but is still a suitable performer for the role. All due to belief trickling down to him and that the film won't turn conventions on its head...yet. Same with Tony Leung who is called upon to be cool and explode into fierce behaviour as this is a murderer by heart and it's at no times less than immersing to see Leung eat celluloid for breakfast while still operating within the range he's supposed to. Even newcomer Kate Tsui is seemingly a simple casting choice as a new kid is meant to play a new kid but within the simplicity factor of the film that again aims for a dead on paced exercise in action-thriller esthetics, Tsui is very much integral to the trio. Add on to that familiar faces to Milkyway productions such as Lam Suet, Eddie Cheung and Maggie Shaw (possibly cursing a lot more colourfully than the English subtitles let us know) and all above would've marked a pass in director Yau Nai-Hoi's directing debut. A big pass with a gold star attached to it even but when approaching the end, Yau isn't even fooled into making the story twist illogically till everyone's heads pops. He instead offers up an ending that won't play favourably all over the place but is strangely true to at least life as Milkyway Image sees it. Yau couldn't resist a bit of irony but it makes Eye In The Sky take a leap into great acceptance as well as being one of many injections for Hong Kong cinema that will add up to competing power in the whole scheme of things. 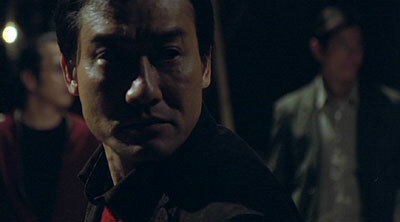 Now someone else besides Johnnie To knows how to make these flicks and differently too! Kam & Ronson presents the film in an aspect ratio of 1.80:1, with anamorphic enhancement. At times featuring mild specks on the print, the desaturated and grainy design of the image seems to be represented well. Audio options are Cantonese Dolby Digital EX Surround 5.1, Cantonese DTS 5.1 and Mandarin Dolby Digital EX Surround 5.1 but as I'm not equipped with such a system, my assessment of this disc aspect will be left off this review. The English subtitles seems to stumble excessively towards the end but are otherwise clear and coherent. 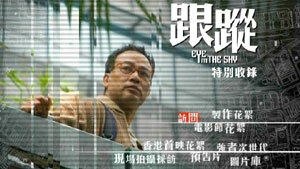 Traditional and simplified Chinese subtitles are also available. Interviews with co-writer and director Yau Nai-Hoi (9 minutes, 21 seconds), co-producer Johnnie To (7 minutes, 55 seconds), actor Simon Yam (7 minutes, 57 seconds), actress Kate Tsui (11 minutes, 22 seconds) and actor Lam Suet (6 minutes, 25 second). Brief behind the scenes footage, including that of To being active on the set is intercut during the Yau interview and Tsui is for whatever reason very emotional during her session. The Making Of (6 minutes, 38 seconds) is your usual promo piece POSSIBLY containing worthwhile info for those who can understand it. In next section we find 4 featurettes (running 4m 38s, 3m 48s, 3m 56s and 3m 58s respectively) covering the various premieres close to home and at foreign film festivals. Brief interviews with cast & crew, outsiders such as Lau Ching-Wan, Patrick Tam, viewing audiences from around the world, Yau Nai-Hoi Q & A's and audience reactions post-screening are on display. The latter being nice moments for the sight of pride in Yau Nai-Hoi's face. Running 10 minutes, 23 seconds, more premiere footage comes from the home grounds in Hong Kong where the producers of the program even name the celebs appearing. Another Making Of (14 minutes, 15 seconds) appear next and feeling no different in intent from the previous aside from Yau's interview session taking place in Italy during the Far East Film Festival in Udinese. The next 2 minutes and 38 seconds are dedicated to another brief behind the scenes program while 4 TV spots and the trailer follows. Rounding it all off is a Photo Gallery (15 movie stills) and a Poster Gallery (7 images).